Mistletoe phoradendron serotinum the oldest of Oklahoma's symbols, adopted in 1893 -- 14 years before statehood. 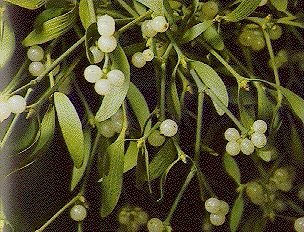 Mistletoe grows on trees throughout the state and is particularly bountiful in the southern regions of Oklahoma. The dark green leaves and white berries show up brightly during the fall and winter in trees that have shed their own leaves.